I've mixed feelings about this set, but I think that is as much because of the repertoire as of the performance. Tchaikovsky was an industrious composer, but when his inspiration ran dry, he would often resolve to write one piano piece a day, just to keep his hand in. Thankfully, those resolutions never lasted long, and the results of them were often humdrum at best. That said, there are a handful of favourites among Tchaikovsky's solo piano works, the 'Grand Sonata' Op.37 is one, as is 'The Seasons' Op.37a. His 'Album for the Young' is well known to many formerly aspiring prodigies, and in fact it is among his best works for the piano. Among his other solo piano works, the favoured genre is the 'Morceau', and opuses entitled 'Morceaux' account for about half of the music here. As the name implies, these are usually short, unambitious salon-type pieces. Of course, Tchaikovsky was a composer of refined tastes and an expert in maintaining an audience's interest. So there is plenty of variety, but no extremes, very little drama, and not much passion either. Those problems are all exacerbated by Franco Trabucco's approach. He seems to have little interest in stretching the music beyond its comfort zone, so for the most part these performances are civilised and straight-laced. It may be that he is being faithful to the spirit of the music, but I can't help the feeling that he would do it more favours if he injected a bit more passion now and then. 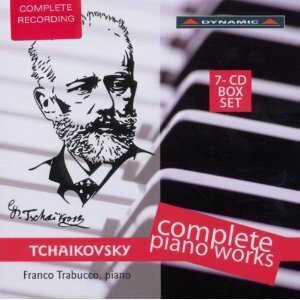 The movements that come across best are the ones where Tchaikovsky is going for a laid back, breezy atmosphere. That accounts for a good many of the 'Morceaux', as well as some of the Seasons, most notably January. In these movements, Trabucco and Tchaikovsky seem to agree on the exact level on nonchalance needed to carry the music. And there is a lightness of touch that Trabucco brings to these movements that brings a real sense of delicacy, if not sensitivity. When the music gets more dramatic, the performances are less convincing. In the opening Morceau of Op.40, for example, the sheer quantity of notes suggests the composer is looking for real turbulence, but the performance is still in laid back mode and it never quite takes off. The grand exception is the Grand Sonata, which is performed with real energy, and with some insight into its bizarre lob-sided structure, which adds up in this performance, thanks in no small part to the sheer energy at the keyboard. The Album for the Young comes across well too. All those tiny vignettes, the funeral march, the organ grinder, the Orthodox chant, they are all played with real character, almost a Pictures at an Exhibition in miniature. The recordings are all taken from live performances. There isn't a peep out of the audience though, so you'd need to be told to even realise they are present. On the other hand, there are a couple of issues with the recording that are clearly bi-products of the live environment. Once or twice, the tuning in the mid-range of the piano goes seriously awry, and unlike in a studio recording, stays like that until the end of the performance. There are a few technical slips in the playing too, mainly splits in the faster passages and slightly uneven runs. But from a technical point of view, the biggest problem is the recorded sound. The piano and the acoustic seem to be at odds throughout, there is no depth to the sound of the bass register, and the treble sounds pretty thin as well. But worst of all, the piano sounds very distant. It just isn't a very engaging sound. So not a recommendation from me for this set. Trabucco is at his best in the well-known works, particularly the Grand Sonata and The Seasons, and of all the discs in this set, those are the ones I would gravitate towards myself. But then, those are also the works that are best represented in the catalogue, and good as these performances are, they are at least a rung below those of Postnikova, Pletnev and Richter.